Cornucopia Plus™ Advantage Bloom is highly effective when used with Cornucopia Plus™ Advantage Grow during the production cycle and as a trigger/boost with Cornucopia Plus™ Formula X. For flowering plants, apply at first sign of budding. Enriched with organic energy metabolites, it will enhance blooming and is formulated to provide plant ready nitrogen in both soil and soil-less growing media. It contains no urea! Plants burst forth with color. Flowers are more vibrant with vivid color and spectacular long lasting blooms, while increasing blossom life. 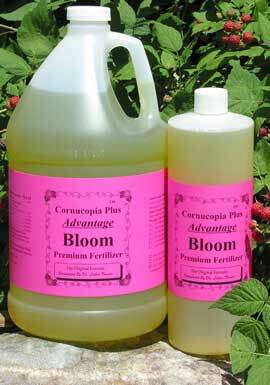 Cornucopia Plus™ Advantage Bloom formula also increases bud blossom biomass. Selected plant extracts provide the organic auxiliary metabolic precursors to enhance the budding and blooming.